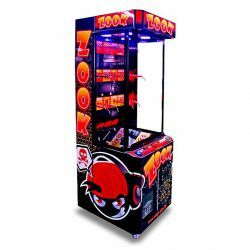 Dimensions (DxWxH) 78" x 30" x 32"
Packing 78" x 30" x 32"
TOP-UP game is a new player in the skill-games market. This riveting game will challenge all player's skills and give them a chance to win superb prizes. Players check their reflexes and perceptive abilities by releasing blocks down to build a tower. They can easily win a small prize or... carry on playing for the ultimate top prize! TOP-UP by default comes with a built in capsule dispenser. Every capsule contains a tiny prize. So whether you win or lose, every player gets a small capsule containing the tiny prize. In this way everyone’s a winner with TOP-UP! TOP-UP is a well built game with eye catching illuminations, graphics and with the possibilities of custom designs. 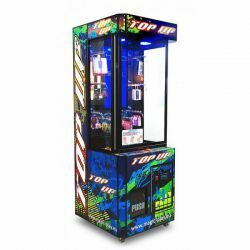 TOP-UP machine can be placed anywhere! Unlike most other skill games TOP-UP is one of the few that can be played by all ages. 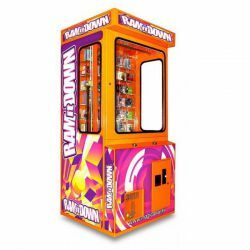 So not only is TOP-UP a fantastic way to earn extra revenue but it can be enjoyed by all! Wait no further! It’s time to TOP-UP your cash box! Magic Play LLC U.s. offers a limited (2) Two year warranty on its electronic components, and (1) one year warranty on the mechanical components. All Magic Play games purchased through Magic Play LLC U.s. will be warrantied from the date of purchase. 3. Exchange tickets for prizes!